Department of Business Communication, National of Institute Technology – Fukushima College, 30 Taira Kamiarakawa Nagao, Iwaki, Fukushima 970-8034 Japan. Research aims: This study aims to examine the Facebook-based grey market transactions of female customers in Vietnam. 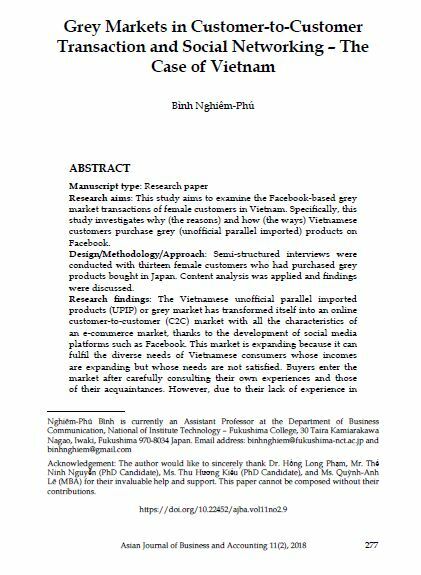 Specifically, this study investigates why (the reasons) and how (the ways) Vietnamese customers purchase grey (unofficial parallel imported) products on Facebook. Design/Methodology/Approach: Semi-structured interviews were conducted with thirteen female customers who had purchased grey products bought in Japan. Content analysis was applied and findings were discussed. Research findings: The Vietnamese unofficial parallel imported products (UPIP) or grey market has transformed itself into an online customer-to-customer (C2C) market with all the characteristics of an e-commerce market, thanks to the development of social media platforms such as Facebook. This market is expanding because it can fulfil the diverse needs of Vietnamese consumers whose incomes are expanding but whose needs are not satisfied. Buyers enter the market after carefully consulting their own experiences and those of their acquaintances. However, due to their lack of experience in buying and using the products in the country of origin, consumers may over-trust the sellers and be taken advantage of. Theoretical contribution/Originality: The grey market of Vietnam has partly merged with the C2C market and the e-commerce market. Grey market customers are better supported by the development of social networking sites (e.g., Facebook) which serve as powerful tools for customer reviews. The grey market, therefore, has been turned into an open one. However, due to the lack of a strong and effective legal framework, it is still unofficial. In addition, since social media platforms have already been transformed into real shopping venues, customers can presently enjoy a personalised service with many of their niche needs met satisfactorily. Practitioner/Policy implications: Legal brand owners should consider opening official stores in Vietnam to exploit the promise of a market whose spending power is the best in the Southeast Asian region. However, before any official entry initiatives are undertaken, a careful market research and a trial basis is necessary. In addition, the Vietnamese government should implement a non-tax policy for social-media-based grey traders as a measure to control the import of illegal or harmful products. The government should also facilitate the introduction of an e-commerce law. Research limitations: This study only captured the opinions of female customers from one urban area of buying UPIPs on Facebook. Those of the male and rural consumers were not investigated. In addition, the current study focused on the buyers’ side of the UPIP transaction and had excluded the sellers’ perspective. Moreover, this study only focused on Vietnam. The activities of the Facebook-based UPIP markets in other countries were overlooked.